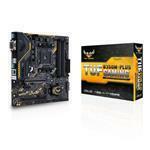 TUF gaming motherboards are built to survive and thrive on every battlefield. TUF B350M-Plus Gaming is the perfect foundation for your micro-ATX battle rig:a solid,durable and camouflaged force that's fit for today's fights,and with the durability to handle multiple upgrades for the campaigns of tomorrow. SafeSlot is the PCIe slot reinvented by ASUS and engineered to provide superior retention and shearing resistance. Manufactured in a single step using insert-molding process,SafeSlot integrates fortifying metal for an inherently stronger slot,which is then firmly anchored to the PCB through additional solder points.